No matter which of the 10 clinics you choose, you will receive the best of what Miami Law has to offer -- the individual and personalized expertise of our full-time clinical faculty who are also practicing attorneys and specialists in their field. You will learn to work with real clients, the courts, opposing attorneys, community organizations and the legislature, and also learn litigation, legislative advocacy, and transactional skills to solve real problems for individuals, and society. For many students, participating in a clinic is one of the most memorable and rewarding experiences in law school. Offer pro bono legal services to low-income individuals dealing with bankruptcy. Represent former and current youth in foster care in dependency, health care, disability, education, immigration and other legal matters. Serve low-income communities seeking fair treatment in the development, implementation and enforcement of environmental laws and policies. Plan, research, and draft federal appeals for indigent criminal defendants. Assist low-income, health-impaired clients through this Medical-Legal Partnership with the Miller School of Medicine. Practice law in the international and cross-cultural context of human rights litigation and advocacy. Advocate on behalf of immigrants in a wide variety of complex immigration proceedings. Represent cases involving innocent individuals incarcerated for a minimum of 10 years who have new potentially exonerating evidence. Represent under-served investors in securities arbitration claims against their brokers before the Financial Industry Regulatory Authority (FINRA). Represent low-income tenants in litigation and administrative hearings primarily involving evictions and denial of affordable housing applications. 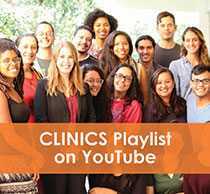 Hear real-world experiences of students and faculty participating in clinical programs - Read about clinics in the news. For information contact your specific clinic of interest. For admissions information, visit the Clinics Admissions page.